Splatoon should be the Wii U's best game. It's one of the most inventive, joyful, and vibrant shooters in years, bursting with energy and a ton of unique ideas. Nintendo has squirted new life into a genre that, for all its explosive set-pieces and viscera, has grown complacent over the years. That's why I'm so conflicted. I should be in love with Splatoon; if only there were more of it to love. Compared to the gamut of gray-brown blood-soaked shooters out there, Splatoon's bubbly personality sticks out in the best possible way. It tries too hard to be down with the kids, unironically dropping phrases like 'totes adorbs' (shudder), but there's something endearing about its cheeky, child-friendly brand of attitude. Its spunky pop-punk-inspired tunes are filled with cutesy, gibberish squid-talk and its bright neon blues, greens, and pinks all clash – and yet somehow go together perfectly. Splatoon is downright effervescent. This attitude extends into the gameplay, as Splatoon focuses less on killing - er, sorry, 'splatting'; this is an E-rated game, after all - and more on controlling territory. You play as an Inkling, an adorable half-squid, half-person with an impeccable sense of style. Being a squid, naturally you're capable of taking your own ink and blasting it through a variety of Super Soaker-esque squirt guns. But it isn't just a gaudy act of vandalism - you can also transform into a cephalopod and swim through your own pools of colour. In Splatoon's main mode, Turf War, your objective is to cover as much of the ground with the colorful liquid as you can. Splatting your opposition certainly helps by taking them out of the fight for a few precious seconds, but if you're strictly focused on taking out the other team, you're not going to win. This simple shift in focus transforms Splatoon from a typical third-person shooter to a spectacular game of tug-of-war, as teams cover ground with their ink, then re-cover it when the opposing team pushes into their territory. There's a wonderful sense of speed as you zip around your own team's pool of ink, dodge around a corner, and watch as your opponent madly flails around while you're swimming circles around them. Pop out of the ink to fire off a few rounds, burst your opponent in a colorful explosion of ink, then pop back in to swim off to your next target. But it's a double-edged sword, because if you wander into the opposing team's ink, you'll find yourself moving slower, taking damage, and unable to duck down and avoid enemy fire. It's fast, it's frantic, and totally different from any other shooter. Splatoon may be desperately short on stuff to do, but there's an easy way to add more - just spend an additional $35 on plastic toys. That's right: at launch, Nintendo will be releasing three Splatoon-themed amiibo, and each one unlocks a series of weapon-based challenges. The challenges themselves are interesting, and completing them earns your Inkling a suite of new gear, but the fact that they're locked behind a paywall at around $13 a pop when there's already so little to do in the game is, quite frankly, kind of disgusting. Different doesn't always mean better, though, and Splatoon discards a lot of the conventions of the genre with varying degrees of success. Surprisingly, the lack of team voice chat and the default motion controls are no problem at all once you actually start playing. Voice chat becomes all but unnecessary, thanks to the helpful Gamepad map and the constant spray of colored ink that makes it visually obvious what you need to do at all times. The motion controls are actually pleasantly fluid (no pun intended) and, while many will likely opt for more traditional thumbstick controls, I found that Splatoon's emphasis on covering the ground over precision shots tends to favor the speed granted by a sweep of the GamePad. The online lobbies, however, don't fare as well. Games will only start once the room is filled with eight players, which makes sense because even one person missing from Turf Wars' four-on-four battles can greatly unbalance a match. There's a cute little minigame that can help pass the time, but there's no way to change your loadout without quitting out of your multiplayer session. Even worse, you can't even see which weapons your teammates are using until a match actually starts, leading to a surprising amount of skirmishes where everyone is packing paint rollers. Sure, it sounds great, until you realize your team is getting wrecked by anyone with a ranged weapon. The simple ability to allow players to choose their equipment while matches load would go a long way to preserving the 'one-more-game' momentum most multiplayer games try to cultivate, especially since matches are already so quick to play to begin with. It's 2015 - this stuff has been figured out already. But these points are minor compared to the lack of content currently offered, and it's what hurts Splatoon the most. The main Turf War mode is great, and the included maps are varied, filled with winding corridors, loads of vertical movement, blind corners, and all sorts of other strategic opportunities to discover. But there are only five maps. Total. And the way that Splatoon doles out those maps only serves to highlight the complete dearth of content. Instead of randomly matching up on one of its five maps, Splatoon instead rotates a selection of two maps every four hours. It sounds like a good idea in theory, as keeping only two active maps will ensure that matches aren't spread too thin. But in practice, this just means that you're likely to end up playing the same map over, and over, and over again. I kept count during one of my sessions, and I played on the same map 13 times in a row. Covering the same bits of the level with ink even twice in succession starts to get a bit boring. After 13, I was ready to call it a day. Once you reach level four, the shops in Inkopolis finally deem you fresh enough to peruse their wares. It's a good thing, too, because these stores offer new weapons as well as stylish clothes that offer all sorts of stat boosts. Here's some haute couture you can spend your hard-earned cash on. The first weapon you'll likely start out with, the Splattershot Jr. is your basic squirt gun. What it lacks in range it more than makes up in its rapid-fire, and the Bubbler will shield you when you go on your close-quarters rampages. The Splattershot is a step up from the Jrs., increasing the range and damage output while sacrificing a bit of speed. It's a bit vanilla, but it's reliable. One of the more unique weapons in Splatoon, the Splat Roller is all about covering territory as fast as possible, as you roll across the ground laying down a path of inky destruction. You can tap the trigger to flick ink out like a slow but powerful shotgun blast. Splatoon's version of the sniper rifle, the Splat Charger shoots out a stream of ink directly in front of you - the longer you charge the trigger, the further it goes. It's not fast, but if you get to a good vantage point and can aim under pressure, this thing can take out Inklings in one hit. This is Splatoon's heavy weapon - a slow, lumbering gun that shoots highly potent bursts of ink at your foes. Instead of a grenade, you get a Splash Wall, and you can use it to create bottlenecks in the map, forcing players to move where you want them to go. In addition to all the weapons you can buy, you can also deck out your Inkling's clothes, shoes, and headgear. Each piece of gear offers a suite of different power-ups, like faster ink refills or increased damage. Continue to fight with a piece of gear, and you'll unlock random new abilities as it levels up. They're not huge game changers, but a well-outfitted Inkling can find a slight edge over her less fashionable peers. It all just brings attention to how little content is available at launch. Splat Zones is a unique take on the typical 'King of the Hill' matchtype, and you can access it by playing ranked matches - which will only be made available once Nintendo flips the switch on its end after a certain, unspecified number of players hit level ten. So, for the foreseeable future, players will only have one match type available to play on two maps, rotated every four hours. Nintendo has also promised that more maps and features will be added later, but when they'll come and if they'll be as good as what's already available is anyone's guess. At least they'll be free of charge. You could attempt to pass the time waiting for new content by playing single-player. Tucked away in a corner of the bustling Inkopolis hub area is a lone, unassuming manhole cover, which will whisk you away to Splatoon's separate solo mode. 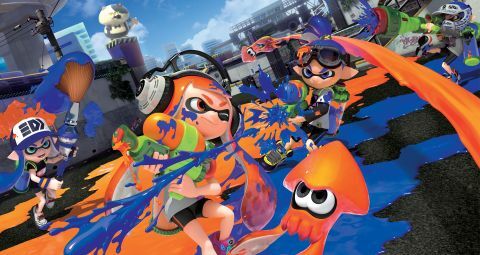 The story is barebones even by Nintendo standards, and it uses an upgrade system completely divorced from all the multiplayer shenanigans - but it's here that Splatoon really gets to dig into all the different ways you can shoot and swim through ink. Each level builds on a different idea; one might contain sponges that grow large when you shoot them, while another might contain an inky tightrope that you can swim through and leap from. Techniques are introduced, expanded and combined smartly, ramping up the challenge as you progress. At around five to ten minutes apiece, they're bite-sized bursts of brilliance, demanding an equal amount of spacial awareness and puzzle-solving ability. While many of the obstacles found here don't appear in multiplayer, playing through all five worlds will teach you everything you need to know to tear up your opponents online. But then, just when it starts to get really good, it's all over. Like the multiplayer, Splatoon's single-player is lacking in content, and completing its five worlds will only take you around four hours to beat. The experience is extended somewhat if you're keen on finding the hidden scroll in each stage, but once you've completed everything (which shouldn't take you longer than a lazy afternoon), there's little reason to come back. It breaks my squid-loving heart to be so down on Splatoon, because the core gameplay offered is one of the freshest and most exciting things to come out of Nintendo in years. But I can't help but feel like this game should have come out three, maybe six months later, when all of the content is finished and included on the disc. As it stands, there's simply not enough game here on day one to make Splatoon anything more than a weekend curiosity, and there's no telling whether the content coming down the pipeline will be worth sticking around for. Description Nintendo's zany Wii U arena shooter.